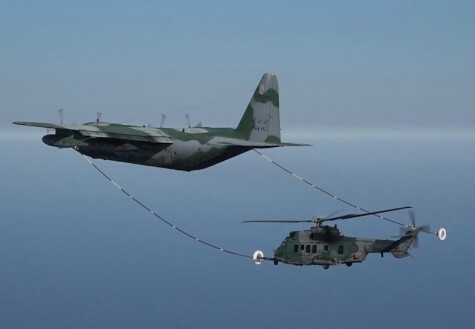 Between Dec 10 and Dec 21, 2018, the Brazilian Air Force (FAB) is carrying out the first phase of the In-Flight Refueling Test Campaign (in Portuguese, Reabastecimento em Voo, REVO) of the Brazilian Air Force’s H-36 Caracal helicopter with the KC-130H tanker aircraft, ensuring that Brazil becomes the first country in South America with the ability to refuel helicopters in flight. The tests take place at Wing 11 (Galeão), in Rio de Janeiro (RJ), in order to certify the helicopter in both day and night conditions, with and without night vision goggles. In this way, specific evaluations of both aircraft will be conducted to determine a safe flight envelope containing speed, altitude and specific configurations. During this phase, ground tests are carried out with the objective of attesting the correct operation of the system by means of functional checks and NVG compatibility between the aircraft by means of qualitative evaluations. The dry-flight flight tests are designed to evaluate the in-flight refueling capability by assessing the degree of turbulence, by verifying possible interference in the anemometric system reading due to air disturbance, and by verifying the operation of the mechanical system in flight. The coordination of the campaign is carried out by the Department of Aerospace Science and Technology (DCTA), which participates with two of its units: the Institute of Industrial Development and Coordination (IFI), a military organization that acts in the certification of quality management systems, and the Institute for Research and Testing in Flight (IPEV), which since 2014 has been working on the theoretical forecasts and preparation of this campaign. In August of this year, approximately 10 military personnel involved in the operation conducted an exchange at the United States Air Force (USAF), where it was possible to become familiar with each of the stages of the REVO. "It was an opportunity to see what procedures are applicable to our aircraft, and to increase the level of safety of the tests," says Lieutenant Luís Gustavo Leandro de Paula, a flight-test engineer at IPEV. The in-flight fuel transfer enables the H-36 to reach anywhere in Brazil’s 22 million km2 territory to carry out rescue missions at sea, for humanitarian aid, for troop infiltrations and military transport to strategic locations. For Major Bruno Roque Teixeira, the flight test pilot responsible for the planning of the campaign, the benefits of the REVO are the increase of the range and reach of the aircraft. "In a peacetime setting, it will be possible to go further in a shorter time. This may be what allows more lives to be saved during a rescue mission at sea," he points out. The H-36 aircraft used in the mission are from the Falcão (1st / 8th GAV) and Puma (3rd / 8th GAV) squadrons, while the KC-130H belongs to the Heavy Squadron (1st / 1st GT). After the successful completion of the first stage, Phase II will be held in 2019, when final certification verifications will be made. In compliance with the contract of the H-XBR project, a test team from Airbus Helicopters will come to Brazil to support the completion of the certification process, by means of wet-flight tests (with fuel transfer) and to train the FAB crews which will operate the H-36 Caracal in future. Pilots and Test Engineers at the Institute of Flight Research and Testing (IPEV) carried out simulated in-flight refueling flights in the institute's simulator in early December to prepare for the flight trials that are taking place now. During the simulated flights, a generic dynamic model of a heavy category helicopter was used in a visual scenario similar to that found in the campaign. Thus, the activity reached the proposed goal of preparing the flight test teams in terms of event chronology, task division, phraseology and methods to be applied during the tests.